Vuodepaikkoja 8. 4 makuuhuone. Remontoitu kauniisti merenranta-huvila. Sijaitsee reunalla rannikolla, tulet rakastamaan poikkeuksellisen merinäköala lahdelle ja upeat auringonlaskut. Suuri terassi, jossa voit valmistaa grillit ainutlaatuisessa Välimeren puutarhassa. Villa on tilava ja siinä on kaikki mukavuudet mitä tarvitset perheen kotiin. Voit nauttia rannat lyhyen matkan ja taiteen kaupungeissa kuten Palermo ja Trapani (30 km). Älä missaa konsertteja ja taidetapahtumia klo Segesta (antiikin Kreikan teatteri) muutaman kilometrin kaukana. Supermarket on 5 min ajo ja siellä on monia ravintoloita, joissa voit maistella tyypillisiä sisilialaisia ​​ruokia. 15 min ajo Palermon lentokentälle, 45 min ajo Trapani lentokentälle. The villa is in need of significant refurbishment. It was also unsafe. We left on the first day. The villa in no way resembled the photos on the HomeAway website which led us to book the villa a year ago. What cannot be over emphasised is the complete overall sense of unpleasant isolation and lack of homeliness. We ended up incurring massive additional cost as a result of not being able to stay at the villa. I really would have expected more having booking though a reputable site (HomeAway), but now understand that they are just the middle men and are ultimately not responsibility in these circumstances. Responding to the guest to contest what he has reported on the villa and inviting customers to view other reviews - from 2013 till today - to understand how the disputes made are unreliable and exaggerated, using the instrument of the review to extort a not due refund. The real problem I think was that he did not like it and I'm sorry about it. The guest having booked almost a year before has had all the time to check the location of the villa. The information provided are truthful as well as photos and I am always at disposal to furnish all the detail needed. A) The villa, as it is well-known on the site, is out of the country of Terrasini and set in a road where there are sequentially a series of villas some of which are habited throughout the year. As you can see from the unique panorama that you enjoy from the terrace is located on the cliff above the sea. - The gardener cares every week on the garden that has lush plants for the entire area. - The fridge in the corner is perfectly functional and serves in addition to the other to provide guests with more capacity. - The kitchen is new and has been purchased in 2014. - The patio like the inside of the house is cleaned by very scrupulous staff and I personally have always found the villa clean and in order. - The garden furniture (two tables with 6 chairs each, four deckchairs with footstools) are kept inside the house to avoid damaging them. But obviously the guest (who arrived around 6pm and left after only two hours) did not have time to notice it. - The fence that prevents access to the spiral staircase leading to the roof (the terrace is at the villa level) has been set to prevent access to it because it is dangerous as the wall of the middle height terrace and with small children could be dangerous. The photos on the site as well as all the information are true but the guest arrived on the spot did not make any controversy (and we talked to know if it was all ok) because some issues he complained (such as cleaning or lack of garden furniture) would be immediately verified and resolved. Instead, the guest preferred to leave without telling me the villa and then discussing everything in the next few days. Das Haus ist ruhig gelegen und bietet alles für einen erholsamen Urlaub. Es entsprach genau den Erwartungen, die wir vom Online-Inserat hatten (Fotos, Beschrieb). Innen und aussen ist alles gepflegt und sauber. Alles ist vorhanden für einen erholsamen Urlaub. Roberto ist sehr hilfsbereit, bei Fragen stets erreichbar. Das einzige was wir vermissten war eine Flasche Wasser bei unserer Ankunft :). Hallo Monika & Thomas, vielen Dank der Überprüfung, ich nehme Ihren Vorschlag und ich hoffe, Sie haben wieder als Gäste. 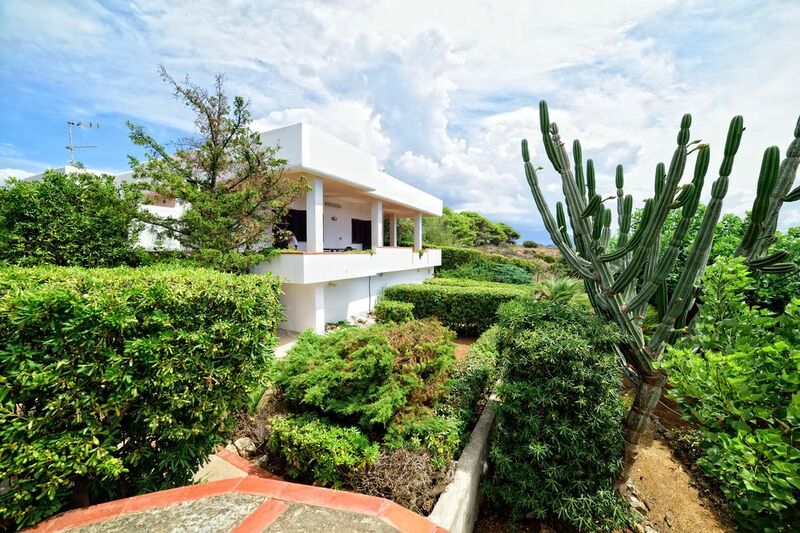 A beautiful spacious villa with stunning views and huge roof terrace. Lovely multilevel garden with excellent brick built-in bbq with large dinning terrace. A unique experience was night-flowering cactus plant we observed over five days from the terrace. Surprisingly, in July we had no flying insects. All the domestic equipment worked perfectly, there were plenty of towels and bedding. Secure parking area with sunshade surrounded by lemon and pomegranate trees. We would recommend this villa if you want a peaceful and isolated environment. Thank you very much Roberto for an excellent holiday. We had the pleasure to rent Villa Linda in Terrasini Sicily earlier this month. Robert the owner was incredibly accommodating for us even going as far as purchasing a coffee make for us. When we arrived there we were in awe of the view this Villa had right on the sea high on a cliff overlooking the bay. The Villa was very nice and had everything one would want for their stay. The gardens and outdoor living space was amazing even having a outdoor cooking area for homemade pizza etc. The area had everything from shopping to great restaurants etc. Terrasini is nearby the airport so its convenient to get in and out of Sicily. We toured the island and were amazed at how much there was to do in Sicily. We knew very little Italian and had no problem with communication during our stay. It was a dream vacation for us and many thanks to the owner Robert for making this happen for us. Ho affittato con la mia famiglia (6 persone) questa splendida villa ad Agosto per 2 settimane e non ce ne siamo pentiti! La collocazione della casa è ideale per chi vuole rilassarsi, visto che si trova in una zona tranquilla e silenziosa, e la mancanza di accesso diretto al mare è compensata dalla vista mozzafiato del golfo di Castellammare. All'arrivo abbiamo trovato tutto pulitissimo, esterno ed interno. Le stanze sono ampie, non mancano i comfort (lavatrice, lavastoviglie, due frigo e la cucina è nuova), mentre la biancheria viene cambiata una volta la settimana. Anche l'esterno è molto gradevole, con giardino curato, barbecue in muratura e doccia esterna per il rientro dalla spiaggia. La distanza da Cala Rossa, ideale per lo snorkeling, è di circa 5 minuti (in macchina) mentre sono necessari 10 minuti per raggiungere la spiaggia e il paese di Terrasini. We (6 people) stayed in Villa Linda for two weeks in July 2013 and that was for sure a great experience. The house has a great location directly at the seaside. Due to the abrupt drop into the ocean, there is no friendly access to go swimming from the house – but the view of the sea is spectacular. For local swimming we strongly recommend the small bay just before you get in to Terrasini. Look for the small paths down to the cliffs/beach and enjoy this local spot for great sunbathing and swimming. You’ll probably spend most of the time in the house, at the terraces. They are spacious and well suited for some slow time at home. And the outside shower will help to cool you down. You’ll need a car to get around. A lot of the “must see’s” is within a decent driving distance and last but not least; a short driving distance to Palermo. We enjoyed making dinners at home, but I know the owner – who you can trust and will service you in the best manner – can support you with some local tips for great dining. Magaggiari beach (5 min. Ajo): tämä on hiekkaranta vain alareunassa Terrasini kylässä. Shore on tilat, kuten ranta ihaillen ja päivänvarjo. Praiola beach (5 min. Ajo): tämä on hiekkaranta vain alareunassa Terrasini kylässä. Rock paikka (aivan vieressä talon). Nuorille ja rohkea (eikä lasten) - on polku 150 mt. päässä huvilasta. Voit nauttia taiteen kaupungit kuten Palermo ja Trapani (30 km). Älä missaa konsertteja ja taidetapahtumia klo Segesta (antiikin Kreikan teatteri) muutaman kilometrin kaukana. – Changeover Day: Saturday. We can accord different day on request. – Arrivals are usually between 5 pm and 7 pm, local time. Any other arrival time must be agreed on with us. – On the departure day, guests must leave the property within 10 am.